Adapted from the 1954 teleplay of the same name, 12 Angry Men (1957) marked the auspicious feature film debut of director Sidney Lumet who had cut his teeth on live television in New York City. He brought a gritty, edgy realism to this film, an approach that flew in the face of traditional, more polished Hollywood cinema. With the exception of Henry Fonda, Lumet eschewed movie star casting in favor of actors with a background in New York stage and T.V. work, like E.G. Marshall, Lee J. Cobb, and Jack Warden. The film’s legacy has endured and been felt for decades and without it there would be shows like Law & Order or John Grisham novels. While 12 Angry Men was well-received by critics at the time, it certainly didn’t set the box office on fire but over the years its reputation has grown and is now regarded as a classic. Lumet begins the film with a solemn opening shot of the impressive pillars of the hall of justice in New York City. In a court room, a Puerto Rican teenager has been charged with murdering his father. If the 12-man jury can find him guilty beyond a reasonable doubt, then he could be given the death penalty as is the case with first-degree murder. And so, the rest of the film plays out in a small room on “the hottest day of the year,” with no air-conditioning as these men must decide the fate of another. Before they get started, the men engage in idle chit-chat – getting to know you stuff as their various personalities begin to emerge. During a preliminary vote, everyone says the kid is guilty except for one man (Fonda) who doesn’t want to condemn him to death until they talk about it. As he points out, suppose they’re wrong. Each man says why they think the teenager is guilty and some range from flimsy (“I just think he’s guilty.”) to logical (Marshall) to opinionated (Cobb) but no one can convince the dissenting juror who makes some pretty good points. The juror isn’t saying that the boy is guilty, just that he’s not sure that he did it. The longer they stay sequestered in that hot room, the more tempers flare up as their prejudices come to bear and the dissenting juror begins to garner support with his rational dissection of the evidence and the testimony from the case. 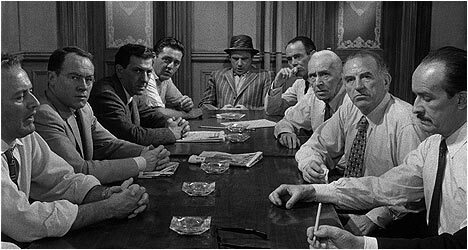 As the film progresses, this impressive cast of actors really impress as they bounce off each other in the small room, from the quiet, reserved juror played by Jack Klugman to the bluster of the juror played by Lee J. Cobb to the unwavering decency of the juror played by Henry Fonda. Lumet is able to keep our interest in the story that unfolds by maintaining the focus on his brilliant cast. He doesn’t try to get fancy with the camerawork or manipulate us with music. He lets the actors do their thing with the first-rate screenplay by Reginald Rose that results in a film that epitomizes the phrase, “hard-hitting drama.” 12 Angry Men is a powerful statement about the American judicial system – one that hasn’t changed much since this film was made except maybe it’s gotten worse – and how personal views and prejudices can influence a jury. The first disc starts off with “The Television Version” that was directed by Franklin J. Schaffner and which first aired on September 1954 for the series Westinghouse Presents Studio One. It obviously doesn’t feature the star-studded cast of the film but is a pretty solid adaptation in its own right. Ron Simon, curator at the Paley Center for Media in New York City, introduces it and puts the program into context, talks about the director, cast and so on. He points out that it was experiment to see if theater could work on T.V. “12 Angry Men: From TV to The Big Screen” features film scholar Vance Kepley talking about how it went from a teleplay to film. Rather fittingly, he briefly gives the origins of 12 Angry Men and its numerous adaptations over the years. He talks about the challenges of working in live T.V. The second disc includes “Lumet on Lumet,” a collection of archival interviews with the director who talks about his long career. He talks about getting into show business as a kid. He also discusses his work ethic and how he applied it to his films. Lumet also shares some of his interesting life experiences. “Reflections on Sidney” features friend and collaborator Walter Bernstein sharing some of his observations of Lumet, like how he enjoyed working with actors. Bernstein also talks about how they became friends and tells some good stories. Ron Simon returns to talk about the importance of writer Reginald Rose who wrote 12 Angry Men. He points that among the great early T.V. writers Rose is the least known and explains the reasons why. Also included is Tragedy in a Temporary Town, a teleplay written by Rose and directed by Lumet. It aired in 1956 and features a few of the actors who would go on to appear in the film version of 12 Angry Men. Finally, cinematographer John Bailey talks about fellow cinematographer Boris Kaufman’s visual style and work with Lumet. He gives a brief biographical sketch of the man. Bailey talks about Kaufman’s early, groundbreaking work with French filmmaker Jean Vigo. He also examines Kaufman’s work on 12 Angry Men.